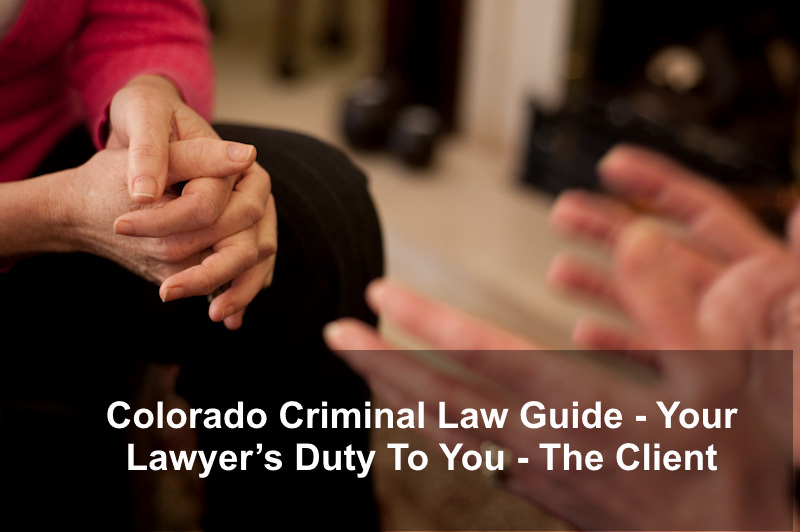 Colorado Criminal Law Guide – Your Lawyer’s Duty To You – The Client – Understanding the relationship between you and your criminal defense lawyer is critical to building the trust that is necessary for the best possible result in the case. The obligations of the lawyer also known as “duties” are comprehensive and sacrosanct. 1. The Duty of Confidentiality – applies to information that is relevant to the relationship and alos applies to all aspects of the client’s representation. This duty never ends. 2. The Duty of Loyalty – is only to the client. 3. The Duty of Candor – toward the court which must be carefully tempered by the primary duties of the lawyer to his or her client – the duties of confidentiality and loyalty. 4. The Duty to Communicate – keeping the client informed and advised of all significant developments, potential options and and possible outcomes. 5. The Duty to Stay Well Informed – applies to understanding the client’s legal options and all developments that bear on the client’s interests during the representation. 6. A Duty of Constant Ongoing Evaluation – applies to the continual evaluation of the possible impact of each decision or action taken at every stage of the case to include a plea bargain, a trial, sentencing, or post-conviction review. 7. The Duty to Be An Effective Negotiator – applies to constant and open negotiated dispositions of the case and includes fully understanding the possible benefits and disadvantages of cooperation with the District Attorney. Which Decisions Uniquely Belong To The Client (The Constitutional right to make the fundamental decisions regarding a criminal case) – Which Decisions Are Made Solely By The Lawyer? In the criminal defense “lawyer – client” relationship – certain decisions relating to the case can be made ONLY by the Defendant – other decisions can be made only by the criminal defense lawyer. 1. The Defendant’s decision of whether to proceed without counsel. 2. The decision of what plea to enter – thatis whether to accept a plea bargain offer or go to trial. 3. The decision of whether to cooperate with the government. 4. The decision of whether to waive jury trial. 5. The decision of whether to testify at a hearing or a trial. 6. The decision of whether to “allocute” (to speak) at sentencing. 7. The decision of whether to appeal such as a verdict. 3. To have a contested issue of guilt beyond a reasonable doubt decided by the jury. In an nutshell, a defense lawyer cannot “give away” any substantial rights of their client and must advise the client regarding as regards all critical issues – provide all relevant information, options, as well as the potential consequences of alternative decisions. While a lawyer may “forcefully urge” a client to make choices that the lawyer believes to be in the client’s best interests – the client has the last word. 1. The design and implementation of legal tactics and strategy. 2. The formulation of a client’s legal contentions to pursue. ….are judgements purely relegated to the criminal defense lawyer. It is clear that criminal defense lawyers have a duty to consult with their clients regarding ‘important decisions’ which do include overarching defense strategies – but the client does not have the right to veto and consent is not necessary for every routine tactical decision. Criminal defense lawyers have the authority to manage nearly every strategic and tactical aspect of the defense without the need to obtain their client’s approval. These lines are not always clearly drawn but while it may be a difficult and complex relationship – it is very important to work hard to establish a relationship of trust and confidence with each and every client. A Defendant’s decisions on such fundamental issues as whether or not to take a guilty plea are not only legally complex – they are emotionally complex. In the final analysis these decisions are influenced more by family and friends then by the lawyer – who in the final analysis – is a stranger. While being charged with a criminal case in Colorado can sometimes cloud your judgement – it won’t cloud ours…. 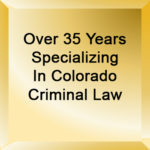 if you are under investigation or charged with a Colorado crime, please don’t hesitate to call our firm for a free consultation. Understanding the relationship between you and your criminal defense lawyer is critical to building the trust that is necessary for the best possible result in the case.